Manco .NET Licensing System can be used in many different ways that can be suitable for single developer as well as for a big company. This configuration is suitable for single developer or small company that uses one computer for development and license management and wouldn’t like to use Activation Web Service. In this configuration the main installation package only is used. It includes protection library and License Manager. 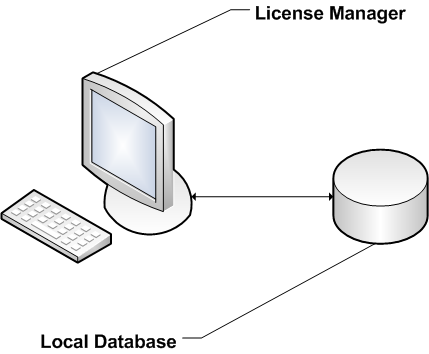 License Manager host Data Service internally and uses local MS SQL Express 2008 R2 database which is located on the same PC with License Manager. This configuration doesn’t suppose using of the Activation Web Service and can be created using “Express Edition”, “Standard Edition” or “Professional Edition” of the Manco .NET Licensing System. 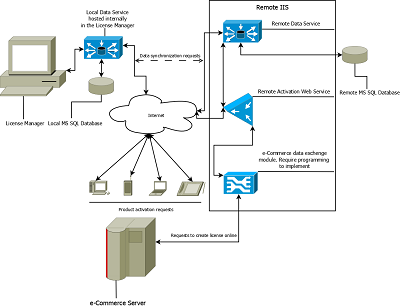 This configuration is suitable for single developer or small company that uses one computer for development and license management and would like to use Activation Web Service on the same PC to activate their product online. 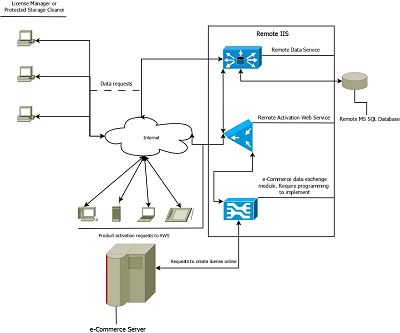 In this configuration main installation package, Data Service and Activation Web Service are in use. 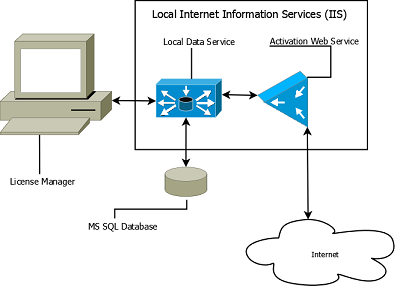 Both License Manager and Activation Web Service use same local Data Service which is hosted on the local IIS. In this configuration all changes made with License Manager are immediately visible for Activation Web Service and vice versa. It means that no data synchronization is necessary between License Manager and Activation Web Service. This configuration assumes that AWS will process product activation requests that come from customers through the Internet. It means that this PC should have Internet connection to be able receive and process those requests. There is an extension for this configuration. Activation Web Service allows creation of the sale records in the database as well as licensing information including license file and/or Unlock Key on demand. It allows establishing communication with e-Commerce services through custom data exchange modules in order to create sale and licensing information automatically. This configuration can be created using “Standard Edition” or “Professional Edition” of the Manco .NET Licensing System with addition of the license for Activation Web Service. Another way is “Standard Bundle” or “Professional Bundle”. “Standard Bundle” includes “Standard Edition” of the main package and license for Activation Web Service. The “Professional Bundle” package includes “Professional Edition” of the main package, license for Activation Web Service and license for protection library for .NET Compact Framework 2.0 and high. 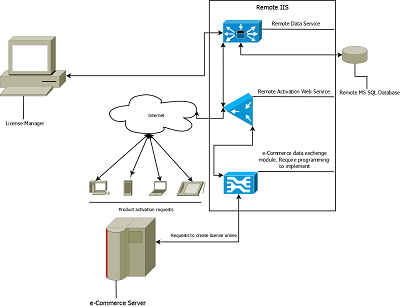 This configuration is suitable for single developer or small company that uses one computer for development and license management and would like to use Activation Web Service, but prefer locate it on the remote host. For example, if developer wouldn’t like make own PC publicly accessible from Internet or can’t get own PC work in 24 x 7 mode for some reasons. In that case developer or company can get account on the ASP.NET hosting and install Activation Web Service there. 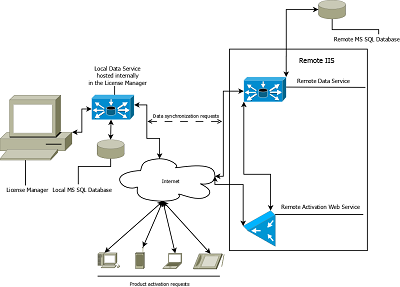 In this configuration main installation package, Data Service and Activation Web Service are in use. Both License Manager and Activation Web Service uses own database. Since the databases are different changes made either by License Manager or Activation Web Service can’t be immediately accessed by second party. It means that data should be synchronized between local and remote Data Services before it can be used. Data synchronization operations are performed by License Manager. 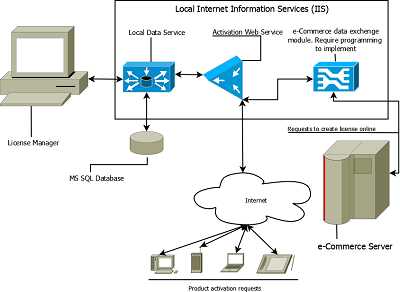 Both License Manager and Activation Web Service use WCF Data Service as a single point of the data access. It allows using of the Manco .NET Licensing System in the company network as complete .NET protection and license management solution. 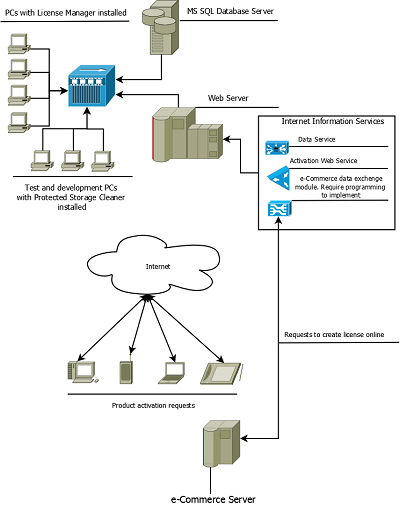 This configuration can be created using “Standard Edition” or “Professional Edition” of the Manco .NET Licensing System with addition of the license for Activation Web Service. Another way is “Professional Bundle”. This package includes “Professional Edition” of the main package, license for Activation Web Service and license for protection library for .NET Compact Framework 2.0 and high. Customers don’t need to by “Standard Edition” or “Professional Edition” for every workplace that uses License Manager. It is enough to buy one major license and necessary number of the “License Manager Additional Seat” licenses.